Spring Water Festival this weekend! Award winning country music singer/songwriter Lucas Hoge will headline the 33rd Annual Spring Water Festival coming this Friday and Saturday, August 22-23 in Williamston’s Mineral Spring Park. The festival will also feature more than 100 craft and business vendors, the area’s largest antique and classic auto show, kids activities, amusement rides, live music and other special attractions including a 5K walk and fun run. The festival will kick off on Friday with Beach Music by the Carolina Coast Band. This newly revised band will provide nonstop, energetic Carolina beach and shag music as well as a flavor of party music and oldies on the opening night of the Spring Water Festival. The band is led by founding member and Williamston resident Joey Werner. Friday night entertainment will also feature a guest performance by five time CBMA Female Vocalist of the Year, Rhonda McDaniel. The AnMed Health Spring Water Run is sanctioned as an RRCA Grand Prix event and will include a 1 mile fun run and 5K run on Saturday. Entry fee is $20 in advance or $25 on the day of the race. Pre-registration ends on August 21. Entry fee for the 1mile is $15. The 5K open race will begin at 7:45 a.m. and the one mile fun run will be held at 8:30 a.m. Registration will be held on the day of the festival, August 23 between 6:15 a.m. and 7:30 a.m. in the parking lot beside McDonald’s in downtown Williamston. More than 50 crafters vendors from three states will join local vendors to display and sell handmade items. The festival will again feature one of the upstate’s largest antique and classic auto shows, being sponsored by the Williamston Fire Department. To register contact Steve Ellison at 864-847-4950. There will be awards in a number of categories. The Fire Deparment will offer rides on the restored 1936 fire truck, a festival favorite. Williamston’s historic Civil War cannon, “Miss Annie Lee” will be on display. The Palmetto Area Cultural Arts Center (PACAC) will have special activities at their new home, the Artory, located on Gossett St.There will an a reception for artist Joel Yates on Friday night and an Open House on Saturday with demonstrations, Shag and other dance lessons, a Strings and Choral presentation, Portrait Paint presentation by Del Priore and story telling and more. Fourteen local and specialty food vendors will offer a variety of delicious festival food items. Music lovers are invited to bring a lawn chair or blanket and enjoy a day of music. The festival features a variety of performers on three stages including a children’s stage, gospel stage and the Mineral Spring Park Amphitheater Stage. The Amphitheater stage area has seen several recent improvements including a stage expansion, new dance area and sod. The Gist Rifle memorial has also been relocated. Scheduled performers include Blue Sky Blues Band, The Royal Scotsmen Band, a special performance by “Patsy Cline” of the Mill Town Players, Angela Easterling and the Beguilers and nationally known country singer Lucas Hoge. Hoge recently celebrated the world premiere release of a new single which is described as a sizzlin’ summertime tune. The single “Flip Flops” is now being played on Sirius XM’s The Highway. Hoge has recorded three country albums, a Christian EP, had songs featured on two TV shows, starred in an HBO TV series, wrote a jingle for Lipton Tea and entertained and supported military troops and their families. His song “If I Only Could” was featured on the Warner Brothers’ show Smallville. His song “Give A Damn” is the theme song for the Great American Country (GAC) celebrity guide show, Tom’s Wildlife. It was the first theme song GAC used for one of its TV shows and the music video stayed at number two in the top 25 videos on www.gactv.com for over two weeks. Hoge’s debut album “Dirt”, won multiple music awards, including ‘Country Album of the Year’ at the Los Angeles Music Awards, which also named Hoge as Contemporary Christian Singer/Songwriter Of The Year for “Get The Door”. He has appeared on TV with Faith Hill in the Sunday Night Football commercial campaign, with Toby Keith in his Christmas special and in a Mary Kay commercial with Danielle Peck and Jennifer Hanson. Hoge had the leading role on the Animal Planet TV show ‘Last Chance Highway’ in 2010 where he was known as the country singer saving dogs. Hoge also penned and performed the shows theme song. On the show he starred as himself, the singer / songwriter who has volunteered to help rescue dogs in the south and transport them north to their new forever homes. The Gospel Stage will feature Craig Ledford; John Rothrock; Chosen Few; Keith Kanipe; Catlin Tierce; Heartstrings; Three Seeds; John Helmuth; Ron King; Roy Witherington; West Anderson Singers; Vessels of Praise; Echos of Mercy and Living Truth. A 2014 T-Shirt is available in lime green or blue and features a new Spring Water Festival logo that was developed through the town’s new Main Street Williamston program. The shirts will be available at the festival. Parking and admission to the Spring Water Festival is free. 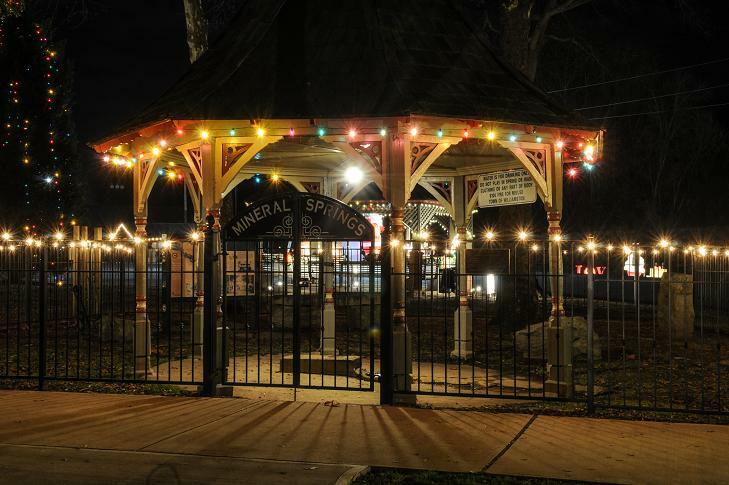 The Journal will publish a Spring Water Festival Program Tab that will be in this weeks newspaper and available in Mineral Spring Park during the festival.